These fall evenings are great for a brisk walk. Leaves everywhere, woodsmoke in the air, raindrops. And local history ripe for the imagination. 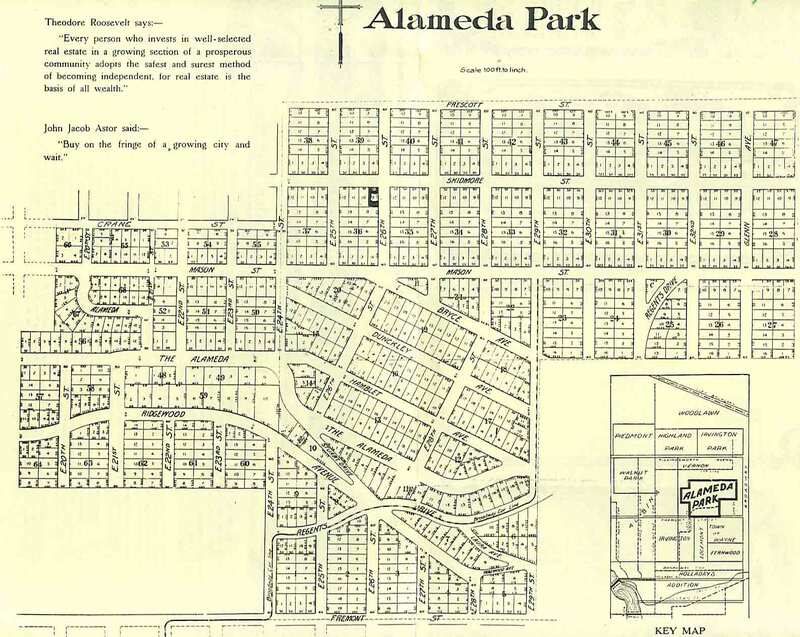 The northwest corner of “The Park” (as in the Alameda Park subdivision) is a little confusing, particularly around Crane Street, which has been significantly changed over time (and is actually part of the Vernon plat). Rather than trying to follow the zig-zag of the property boundary, I just walked Prescott to NE 20th to the shadow of the big water tower. Then south to Alameda Drive and around the corner to 21st, then west on Ridgewood to 20th, and then left down the hill. When you are on 20th above the ridge, from Prescott to Alameda, you can see the difference in the neighborhood plats, with Sabin to the west on one side of the street with smaller homes on smaller lots. Turning left (east) on Fremont, you have the long straight south edge of The Park to walk, passing by where the streetcar ran up 24th and the busy commercial hub that included the Alameda Pharmacy, the old Safeway (now the bank) and what used to be two gas stations. I think of the northeast and northwest corners of NE 24th and Fremont as the gateway to The Park because that’s where the streetcar ran, and because of the business district here. Next, you pass east by the school, built in 1921 after much lobbying by the locals and a few protests that the construction contract was awarded through some favoritism (future blog post, stay tuned). The plats off to your right are Waynewood, the Town of Wayne and Edgemont, names long forgotten. Tip your hat to the Pearson Pine, the big old ponderosa pine tree on the southeast corner of NE 29th and Fremont. It’s been there since at least 1885. Up the hill you go. As you pass the staircases that head up to the top of the ridge, keep in mind there are old water mains under those steps, placed when they were built in the teens. At one point, maybe in the 1920s and early 1930s, women from the Alameda Tuesday Club acted as ushers for young children passing up and down these stairs on their way to and from school. The crest of the hill at Fremont and 33rd is Gravelly Hill, which was both a gravel pit and garbage dump for many years. The dump was under the southwest corner, where a fine house sits today. As you walk north on 33rd, think about the 33rd street woods (today’s Wilshire Park), originally part of the Kamm Estate, which was a dense forest that played a large part in the memories of youngsters who grew up there in the 1930s and 1940s. While you’re enjoying the evening, you can also tip your hat to the home guard, made up of Alameda dads, who patrolled the neighborhood at night during the World War II years, enforcing blackout rules and making sure families kept blankets and light dampers up on their windows. And then there are the thousands of stories that rise up from the generations who have lived in the homes you’ll pass. Lots to wonder about as you and the dog push on around the corner at Prescott and head into the home stretch (being sure to have a look up the alleys north of Prescott as you scope your next walk). So nice to be out on a history walk on a brisk November night. Next: Walking the route of the Broadway Streetcar. Thank you for a look into the past. I’m enjoying your blog! The house at Gravelly Hill? Do you remember the white house that used to be there, that was moved to a Street of Dreams and gained a second story? Don’t remember what year, but it was after 1995. Thanks for visiting…glad you are enjoying the blog. Yes indeed, I do remember the white house that was perched on the southwest corner. It was a ranch-like place with a pool in the back, as I recall. 1995 seems like a reasonable timeframe. I didn’t know it was reused at the Street of Dreams. Adaptive reuse is good…didn’t know they did that kind of thing at Street of Dreams.